Sega's history is a long an extensive one, but as of recently, nobody seems to be able to think about anything other than the sudden fiscal arrest that cut short the Dreamcast's lifeline less than three years after its spectacular release. 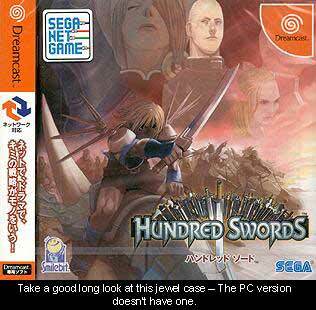 Hundred Swords, one of the first of the last titles, was originally supposed to see a US release, but upon the announcement of the cancellation of the Dreamcast, all thoughts of a domestic release were gone. However, Sega's rise from the ashes as a software-centric company has given way to a domestic release of Hundred Swords on the PlayStation2 and, of all platforms, the PC. This is somewhat odd given that the PC already has its share of RTS titles for Hundred Swords to compete within, and they're PC-native, which means that Hundred Swords may have an uphill battle for itself with its release on the PC. Sega hopes to counter this by releasing it direct-to-budget via Activision Value. So, how is the game? Read on.